Chicken erythrocytes are involved in immunity through binding of toll-like receptors (TLRs) with their ligands to activate downstream signaling and lead to cytokine production in erythrocytes. Some avian β-defensins (AvBDs) are constitutively expressed in tissues and some others can be induced by various bacteria and viruses. However, the expression of AvBDs in erythrocytes has not yet been studied extensively. The transcripts of eight AvBDs (AvBD1 to AvBD7, and AvBD9) and liver-expressed antimicrobial peptide-2 (LEAP-2) were found in normal chicken erythrocytes. The expression levels of AvBD2, 4 and 7 were significantly increased (P < 0.01), whereas the levels of AvBD1, 6 and 9 were significantly decreased (P < 0.01) after Marek’s disease virus (MDV) infection. The mRNA expression level of LEAP-2 was not significantly changed after MDV infection. Highest viral nucleic acid (VNA) of MDV in the feather tips among the tested time points was found at 14 days post-infection (d.p.i.). In addition, 35 MD5-related gene segments were detected in the erythrocytes at 14 d.p.i. by transcriptome sequencing. These results suggest that the AvBDs in chicken erythrocytes may participate in MDV-induced host immune responses. Erythrocytes are the most abundant cells in circulation and the most important cells in the transportation and exchange of gases. In addition, several studies have reported that chicken erythrocytes play an important role in immunology . For example, erythrocytes of vertebrates are nucleated and contain organelles in their cytoplasm, except in mammals . It has been reported that the expression of cytokine transcripts in salmon erythrocytes were induced by infection with infectious salmon anaemia virus (ISAV). Similarly, cytokines, produced by trout erythrocytes when exposed to Candida albicans, enhanced the phagocytic capabilities [3, 4]. Moreover, the transcripts for many toll-like receptors (TLRs) were constitutively expressed in erythrocytes . Chicken erythrocytes can induce the expression of transcripts for some cytokines and secrete thermo-labile molecules, which can enhance the antiviral capabilities of macrophages in response to TLR ligand treatments, such as type I interferons (IFNs) and interleukin (IL)-8 [1, 5]. Marek’s disease (MD) is a contagious lymphoproliferative disease caused by Marek’s disease virus (MDV), and can lead to tumors, lymphocyte proliferation, and ultimately death in chickens . MDV has been evolving worldwide over the past few decades. The emerging MDV strains have changed from mild MDV (mMDV) to very virulent MDV (vvMDV) and very virulent plus MDV (vv + MDV) . Host defense peptides (HDPs), also known as antimicrobial peptides, are a group of cationic amphipathic peptides that are produced by the host itself; they play a vital role in innate immunity and could kill various pathogenic microorganisms such as bacteria, fungi and even enveloped viruses [8–11]. Avian β-defensins (AvBDs) is the only type of defensin found in chickens [12–14]. Researchers are more interested in HDPs or their derivatives, because they believe HDPs could fight and protect against infectious diseases . Recent studies have determined that TLRs, AvBDs and cytokines are involved in the response of the immune system in various tissues . But the changes of expression level of AvBDs in chicken erythrocytes after MDV infection has not yet been investigated. The aim of the present study was to explore the transcriptional levels of AvBDs and liver-expressed antimicrobial peptide-2 (LEAP-2) in erythrocytes of chickens infected by MDV. The results of the reverse transcription-polymerase chain reaction (RT-PCR) showed that the genes expression of AvBD1 to AvBD7, AvBD9, and LEAP-2 was detected in the normal commercial chicken erythrocytes, but not for AvBD8, and AvBD10 to AvBD14 (Fig. 1), and no bands were found in the negative controls. AvBD1 to AvBD7, AvBD9 and LEAP-2 genes expression was also detected in specific pathogen-free (SPF) chicken erythrocytes (data not shown). These detected genes expression was further confirmed by Sanger sequencing and Real-time PCR. No severe clinical symptom except late phase depression was observed in 14 d experimental period. The copy numbers of MDV were tested at 4, 7, 9 and 14 days post-infection (d.p.i.) by duplex real-time PCR (Fig. 2). The results showed that the MDV was detected after 7 d.p.i., and the MDV copy number at 14 d.p.i. was significantly higher than that of all other time points. MDV nucleic acid was not detected in the control group. To determine whether MDV invaded chicken erythrocytes which could activate AvBDs expression against the infection, we performed a search for virus genomes in the transcriptome of erythrocytes on 14 d.p.i. (SRA accession No: SRP136403) when the MDV load was significantly higher than that of all other time points. The results showed that the transcripts of 35 MD5-related genes were detected (Table 1). These genes were mainly phosphoprotein pp24, major capsid protein, assembly protein, major DNA-binding protein, deneddylase, DNA polymerase processivity factor, tegument protein VP16, and deoxyuridine triphosphatase, in which the copy number of phosphoprotein pp24 that act as an integral component of membrane was the most abundant. These results indicated that erythrocytes had been invaded by MDV. To further investigate the functions of these genes during MDV infections, their expression levels in the erythrocytes were analyzed. We utilized real-time RT-PCR to quantify the repertoire of AvBDs expressed in chicken erythrocytes in response to MDV on 14 d.p.i.(Fig. 3). The expression levels of AvBD2, 4 and 7 were significantly upregulated compared to the control group (P < 0.01). However, the gene transcript levels of AvBD1, 6 and 9 in the experimental group were significantly lower than those in the control group (P < 0.01). 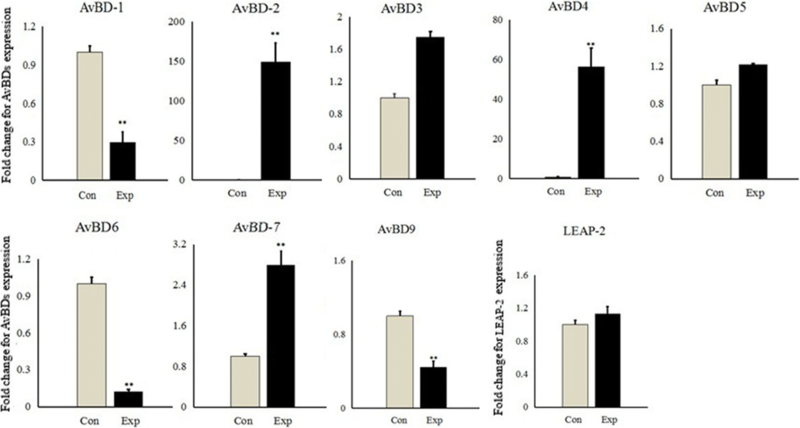 There was no significant difference for AvBD3, AvBD5 and LEAP-2 between the two groups. Recent studies have reported that erythrocytes play an important role in immune responses. It has been found that trout and chicken erythrocytes can detect and specifically respond to different pathogen-associated molecular patterns (PAMPs) . In the present study, it was observed that AvBDs and LEAP-2 transcripts are expressed not only in tissues but also in erythrocytes. This result provides a new perspective for poultry health, as the expression of these transcripts may be linked to the protection of chickens from pathogens. Primary literatures showed that AvBDs are not only largely associated to reproductive organs but also to bone marrow [17–19], and more generally to mucosal tissues. The transcripts for 13 types of AvBDs were expressed in chicken reproductive organs . It has been reported that AvBD1, 2 and AvBD4 to AvBD7 were highly expressed in bone marrow of chicken [18, 19, 21]. Strong expression of AvBDs transcripts was found throughout the digestive tract such as in the esophagus, craw, proventriculus, and intestinal tissues, except for AvBD11 [16, 22, 23]. This is similar to our results that AvBD1 to AvBD7 and AvBD9 transcripts were detected in chicken erythrocytes. Moreover, many AvBDs also were found and regulated by both pathogenic and attenuated infectious bronchitis virus (IBV) strains in many highly vascularized tissues, such as liver, spleen and kidney [24, 25]. The expression of AvBDs was also observed in other tissues such as the respiratory tract and skin [12, 17, 21]. As the most abundant circulating cells, erythrocytes are distributed in all of these tissues. All of the above support the hypothesis that erythrocytes can participate in the immune response in various tissues, especially highly vascularized tissues, by releasing AvBDs to fight pathogens. The results from current study indicated that MDV genome load in the feather tips was significantly increased at 14 d.p.i.. Similar results were reported by Abdul-Careem et al . This could be because some latent MDV was reactivated and started the second cytolytic phase by 14 d.p.i. . The transcripts of 35 MD5-related genes in erythrocytes indicated that MDV invaded the membrane or intracellular of erythrocytes. The explanation for the results could be 1) the viral PAMPs were recognized by the pattern recognition receptors (PRRs) on the surface of erythrocytes; 2) MDV invaded and replicated in the erythrocytes; 3) there was an interaction between MDV and erythrocytes. However, the molecular mechanism needs to be further elucidated. TLRs are associated with immune cells and other tissue cells . It was recently found that chicken erythrocytes constitutively express transcripts for many TLRs as well as for some cytokines and other immune-related genes such as IFN-α, IFN-β, and IL-8 . AvBDs can be induced by the interaction of TLRs with their ligands and proinflammatory cytokines [27, 28]. The results of the present study show that it is possible that erythrocytes can participate in some of these aspects. Furthermore, many MDV-related genes and differentially expressed AvBD2 were detected in the transcriptome of erythrocytes, suggesting the expression of AvBDs in erythrocytes may participate in the antiviral response against MDV infection. The significant upregulation of AvBD2, 4 and 7 was found after MDV infection, which may result from the activation of broader innate immune signaling pathways after PRRs-viral PAMPs interaction, and this still needs further researches to confirm. We found that the upregulated expression of AvBD2 is the most significant result obtained after MDV infection. Similarly, some studies found that AvBD2 was also upregulated by the infections of pathogenic IBV and pigeon paramyxovirus type 1 (PPMV-1) in most tissues . Furthermore, it has been reported that AvBD2 is the major defensin in heterophiles [27, 29]. We speculate that AvBD2 may be expressed as functional proteins. In duck tissues, significant antiviral activities of three AvBDs (Apl_AvBD4, 7 and 12) were shown against duck hepatitis virus (DHV) . In another study, the recombinant AvBD2, 6 and 12 displayed the obvious anti-viral activity against IBV in vitro . These suggested that AvBD2, 4, 6 and 7 may have strong antiviral activities in chicken erythrocytes. Moreover, we also found that the transcripts of AvBD1, 6 and 9 were significantly downregulated after MDV infection; this may be associated to the viral immunomodulators that fight against these AvBDs after MDV infection. The LEAP-2 expression in erythrocytes during MDV infection has also been found; thus, we speculate that LEAP-2 might also be an effector of innate immune signaling as a response to some pathogens . The modulation of AvBDs in response to the bacterial components or ligands for TLRs in chickens have already been studied [1, 20, 23], but the reaction of AvBDs in response to MDV in chicken erythrocytes has not yet been investigated. Based on the expressed repertoire of AvBDs, it is possible that erythrocytes can respond both virus and bacteria, which is supported by the fact that AvBD2 which is highly overexpressed in response to MDV possess a strong antibacterial activity . This finding is also supported by another fact that the transcript of type I IFNs are also expressed in chicken erythrocytes and are upregulated after the treatment with poly I:C or CpG ODN , such that a second wave of signaling pathways would be activated to synthesize IFN-regulated proteins contributing to the antiviral response and inhibiting virus replication . Another study showed the expression of several AvBDs was closely correlated to the expression of TLR3, TLR7 and TLR15 in tissues . All the above clues supported the possible defensive mechanism of chicken erythrocytes that the PAMPs could be recognized by various PRRs, such as TLRs and scavenger receptor (SR). Cytokines, AvBDs and other molecules will be activated and modulate host immune response when pathogens invade into the blood. In conclusion, the transcripts of eight AvBDs and LEAP-2 were identified in chicken erythrocytes. The transcripts of 35 MD5-related genes were found in erythrocytes after MDV infection. MDV induced an immune response wherein AvBD2, 4 and 7 were significantly upregulated and AvBD1, 6 and 9 were significantly downregulated. Further studies are needed on the mechanism of AvBDs in the response of chicken erythrocytes to MDV infections, which could help to prevent and control MDV in the future. Three 3-week-old roosters (Hy-Line Brown) were purchased from a commercial supplier in Taigu County. The roosters were kept in cages, under an artificial light regimen of 14 h day-time/10 h night-time. A diet appropriate for their age was provided ad libitum. Before exsanguination and necropsy, injection of pentobarbital was used along with the standard protocols of euthanasia to minimize animals suffering. Venous blood was drawn from these chickens (2 mL per bird) and mixed with the same volume of Alsever’s solution (Solarbio, Beijing, China). The diluted blood was added carefully into a 4 mL Histopaque-1119 solution (Sigma–Aldrich, Oakville, ON) and centrifuged at 500 g for 20 min; subsequently, the supernatant containing platelets and leukocytes-was removed. Subsequent procedures were performed as described earlier . Isolated erythrocytes were determined to be > 99.9% pure by Wright–Giemsa staining. Total RNA was purified from erythrocytes isolated from blood samples using RNAiso Plus (Takara Bio Inc., Dalian, China) according to the manufacturer instructions, and dissolved in 20 μL RNase-free water. Purified RNAs were examined by 1.5% agarose gel electrophoresis and a NanoDrop Bioanalyzer ND1000 (Labtech, Uckfield, UK). The criteria for assessing the quality of RNA were that 28S and 18S rRNA could be seen in the gel and the A260/A280 ratio was between 1.9–2.1. cDNA was synthesized from 500 ng total RNAs using the PrimeScript RT reagent Kit with gDNA Eraser (Takara Bio Inc., Dalian, China) according to manufacturer instructions. The cDNA samples were diluted at 1:10 in sterile water and stored at − 20 °C. Primers were designed by Primer Express 3.0 (Applied Biosystems, Foster City, CA, USA) and synthesized by Shanghai Generay Biotech Co., Ltd. (Shanghai, China). GenBank accession numbers of the reference sequences used for primer design are presented in Table 2. The PCR was conducted in a volume of 20 μL of reaction mixture containing 2 μL of cDNA, 0.4 μL at 10 pmol/μL of each of forward and reverse primers, 10 μL 2 × MasterMix (Real-Times Biotechnology Co., Ltd., Beijing, China) and 7.2 μL double-distilled H2O. The cDNA was replaced by water as negative control for each gene. Amplification for AvBDs or LEAP-2 was performed in a Gradient Thermocycler (Eppendorf AG, Germany). The optimum thermal cycling procedure was as follows: 95 °C for 3 min; 35 cycles of 95 °C for 30 s, 55 to 57 °C (the optimal temperature of AvBDs, listed in Table 2) for 30 s, and 72 °C for 1 min, followed by 72 °C for 5 min. The PCR results were detected by electrophoresis in 1.5% TAE agarose gels, and imaged by GelDoc-It Imaging Systems (Ultra-Violet Products, USA). Twenty 1-day-old SPF chickens (B15 haplotype), very virulent MDV strain MD5, and recombinant plasmid pMD-O containing the ovotransferrin gene and recombinant plasmid pMD-M containing the MDV Eco Q (meq) gene were provided by Dr. Lingxia Han of Harbin Veterinary Research Institute, Chinese Academy of Agriculture Sciences (Harbin, China). The strain of MDV (MD5) was preserved in liquid nitrogen until use. The chickens were equally divided into two groups: an experimental group and a control group. The animal experiment was carried out in an Animal Biosafety Level 2 Laboratory. The MDV was diluted properly with sterile phosphate buffered saline (PBS) (Solarbio, Beijing, China). Each chicken in the experimental group was intra-abdominally infected with MDV at a dose of 500 plaque-forming units (PFU)/500 μL. The control group was injected with the same volume of PBS. On 4, 7, 9 and 14 d.p.i., 4–5 feather tips were collected from each bird in the experimental and control groups and preserved in liquid nitrogen immediately. Anticoagulated blood samples were collected at 14 d.p.i. for both groups and used for total RNA extraction as described in Experiment 1. Before exsanguination and necropsy, injection of pentobarbital was used along with the standard protocols of euthanasia to minimize animals suffering. All these tests were performed by Lingxia Han at Harbin Veterinary Research Institute, Chinese Academy of Agriculture Sciences (Harbin, China). RNA was extracted from the erythrocytes. A total of 1 μg purified RNA per sample was used for next-generation sequencing (NGS). Sequencing libraries were generated using NEBNext®Ultra™ RNA Library Prep Kit for Illumina® (NEB, USA) following the manufacturer’s instruction, and index codes were added to attribute sequences to each sample as described previously . The libraries were sequenced by Illumina HiSeq 2500. To identify the viral sequence, the clean reads were mapped to the reference genomic sequence by Tophat2 tools software , and each unigene was then transformed into FPKM (Fragments Per Kilo base per Million mapped reads) by using RSEM software . Annotations of the unigenes were searched using BLAST against the Nr (non-redundant) and the Swiss-Prot databases (E-value ≤10− 5). RNA was extracted from the erythrocytes on 14 d.p.i.. The quantitative expression analysis of AvBDs and LEAP-2 genes were performed with real-time RT-PCR using a TaKaRa SYBR Premix Ex Taq™II (Takara Bio Inc.). The total volume of real-time PCR mixture contained 6 μL 1× SYBR Premix Ex TaqII, 0.1 μL ROX dye II, 1.5 pmol each of forward and reverse primers, 1 μL of diluted cDNA, and 2.6 μL of double distilled H2O. The reaction mixture was placed into MicroAmp® Optical 8-Cap Strip (Applied Biosystems), and real-time PCR was performed following user instructions of the QuantStudio™ 6 (Applied Biosystems). Briefly, each reaction involved a pre-incubation at 95 °C for 3 min, followed by 42 cycles of 95 °C for 30 s, 55 °C - 57 °C (TA as per primer) for 30 s, and extension at 72 °C for 10 s. The expression level of AvBDs and LEAP-2 were calculated relative to that of the housekeeping gene 18S rRNA using the QuantStudio™ 6 Flex Real-Time PCR System Software (Applied Biosystems, USA). DNA was extracted from feather tips collected at 4, 7, 9 and 14 d.p.i. using Trizol reagent (Invitrogen, Carlsbad, California, USA) as described previously . The purity and concentration of purified DNAs were detected by a NanoDrop Bioanalyzer ND1000 (Labtech). The feather tips DNA was then diluted to 100 ng/μL for future use. Primers and probes of the duplex real-time PCR (Table 3) for MDV meq gene and ovotransferrin gene followed that by Islam et al. and Baigent et al. , respectively. Chicken ovotransferrin genomes gene was used as DNA extraction reference. Serial 10-fold dilutions (104–1010 copies/μL) of the recombinant plasmids of pMD-O and pMD-M were used to generate a standard curve for ovotransferrin and meq gene. The duplex real-time PCR was performed in a 25-μL volume. The reaction mixture included 2.5 μL 10 × Ex Taq buffer; 1 μL dNTPs; 0.2 μL HS Ex Taq; 8 pM meq-P and ovo-P probes; 10 pM meq-F, meq-R, ovo-F and ovo-R primers; 1 μL pMD-O and pMD-M. Sterilized H2O was added to bring the final volume to 25 μL. The protocol for the reaction was as follows: 95 °C for 5 min; 40 cycles of 94 °C for 15 s, 59.5 °C for 50 s. The fluorescence intensity of the reporter dye (FAM and ROX) was measured during the 59.5 °C annealing/extension step. The data analysis was performed using an iCycler Thermal Cycler (BioRad, Hercules, CA, USA) generating the standard curve. For the detection of the copy numbers of MDV in feather tips on 4, 7, 9 and 14 d.p.i., the DNAs in feather tips were used as templates for the duplex real-time PCR assay to detect the meq and ovotransferrin. The copy numbers of MDV were calculated using the standard curve. The 2−ΔΔCt method was used to calculate the real-time PCR data. Data represent mean fold change from PBS-treated controls ± standard error. Statistical analyses were performed using SPSS statistical software 17.0 (IBM Company, New York, NY, USA). The data of virus load was subjected to one-way ANOVA and then analyzed by the Tukey’s pairwise comparison to identify treatment differences which were considered significant when P < 0.05. Statistical significance of each gene expression between the experimental group and the control group was analyzed using t-test for independent samples. Differences were considered significant when the P-value was *P < 0.05 or **P < 0.01. The authors are very thankful to Gary Wong (Institute of Microbiology, Chinese Academy of Sciences, Beijing, China) and Tuoying Ao (Alltech, USA) for help with English language quality of the manuscript. This work was supported by the National Key R & D Program (2016YFD0500800), Research Project Supported by Shanxi Scholarship Council of China (2017–073), Key scientific and technological innovation platform of Jinzhong (P171002–3), the National Natural Science Foundation of China (31072179), Key Technologies R and D Program of Shanxi Province (20130311027–3) and “131” Leading Talent Project for Colleges and Universities of Shanxi Province. Most data supporting findings are provided within the text. Original data are available from the corresponding author on reasonable request. All transcriptome sequences have been submitted in Sequence Read Archive under the SRA accession number: SRP136403. SN drafted the basic manuscript and analyzed the data. WXT, LXH, GFG and YHB contributed to conception and design of the research and reviewed the manuscript. ARJ, FJJ, XL, GBN, DZ, HLM and WFH participated in sample collection and laboratory testing. WWG, YJZ, SMG, GLL, JHL, FY and RKG participated in the data analysis and revising the manuscript. All authors read and approved the final manuscript. The protocols for animal studies was approved by the ethical committee of College of Animal Science and Veterinary Medicine of Shanxi Agricultural University, China (Number 88, 2010) and approved by the Committee on the Ethics of Animal Experiments of the Harbin Veterinary Research Institute of the Chinese Academy of Agricultural Sciences (approval no. SYXK (Hei) 2011–022).